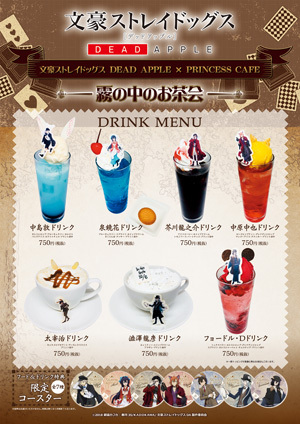 This limited time ‘Alice in Wonderland’ themed collaboration pop-up café will be held with Princess Café (プリンセスカフェ) at 5 locations across Japan from 2/23/29 - 4/7/19. During this collaboration a special food & drink menu will be available to fans as well as novelty items & goods for purchase. At 9:00AM JST each day the café will distribute numbered tickets for a specific time slot. Tickets are first come first serve and cannot be re-issued if lost. If you do not receive a ticket that day you will only be seated if the café isn’t full. Seating methods may change suddenly so be sure to follow staff directions to the best of your abilities. If you’re looking to use the goods shop: On /23 & 2/24 the goods shop is only accessible to customers who dine at the café. There are purchase limits on select items. Customers who order off of the collaboration food or drink menu will receive an original coaster (1 out of 7 designs) at random per order while supplies last.